For the better part of a decade, RVNG’s FRKWYS series has been linking contemporary artists up with their logical influences. 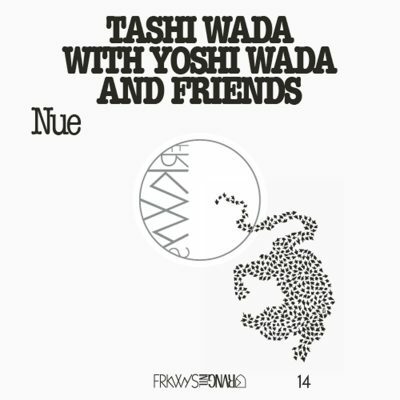 In what has to the most wholesome edition so far, drone composer Tashi Wada gathers a group of his friends (including Julia Holter and Corey Fogel) and his father, esteemed musician Yoshi Wada, to realize a set of pieces that explore a mysterious connection between space, harmony and timbre. As far as the textures on Nue go, they’re wholly strange and constantly in flux. After a brief intro by Tashi alone on a synthesizer, the full group enters for the otherworldly hum of “Ground.” The instrumental mix alone is something unique: muted bass drums, synthesizer swells and bagpipes. This isn’t the first time the Wada family has used this nasally instrument before, but the sound can take some getting used to for anyone not familiar with their prior work. Especially contrasting the soothing low end of the other players, the piercing drones of the bagpipes are jarring. This odd mix never stops the structural aspect of the pieces from speaking, and the music of “Ground” is a fascinating exercise in patience. Most of the track feels like one note stacked on top of itself in a dozen layers. As the music progresses, each individual slowly adds a subsequent pitch or harmony to build a mass of sound. In its final moments, some of the synths start to glitch and shift, brining in an anxious feeling that was always present but masked as a dreamy wash. While this extended, layered approach remains throughout the record, the group’s ability to alternate moods and sound combinations keeps the music form stagnating. One of the most haunting and memorable tracks is “Ondine,” the only cut to bring in musicians beyond the core quartet. Simone Forti, Jessika Kenney and Laura Steenberge join Holter to form a choir of eerie, wordless vocals. In a broad sense, it accomplishes the same thing as the tracks preceding and following it: stretching out a single sound, only adding new sounds when it becomes absolutely necessary. Here, though, the overall effect is more tumultuous. Yoshi has roots in the 1960s performance art movement Fluxus, and that group’s surreal, kitchen sink approach is present. On a few tracks, the Wadas play intricately pitched sirens, and on “Bottom of the Sky,” Holter and Yoshi enact a duet between resonant bells and alarm clocks. In the 50-some years since the origin of these practices, however, Yoshi and the generation after him have gained a new understanding of how to translate these ideas into something other than gleeful absurdism. This growth in sincerity is present the most toward the album’s close. As the mood shifts to introspection. “Mutable Signs” is a duet between Holter and Tashi, and it offers Nue’s most calming moment. The duo builds a cushiony base of an uncharacteristically moving harmonic progression, and Holter gives a vocal performance that is nothing short of heavenly. The music glistens and offers a welcome contrast to the surrounding discomfort.